Pasta is quick and easy to cook. All I need to do is to open a packet of dried pasta and pour them into a pot of boiling water. It seems so convenient to cook a decent pasta dish but why am I making my own fresh pasta from scratch today? 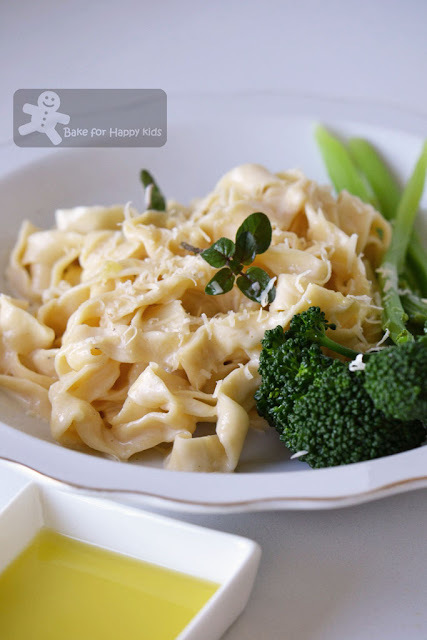 Tagliatelle are long and flat ribbons pasta that are similar in shape to fettuccine and are typically about 0.65 cm to 1 cm wide and it is great to eat with thick sauces just like the cheesy sauce that I'm cooking with this recipe. As mentioned in this recipe, any nice melting cheese can be used to make this oozy cheesy sauce and I have chosen to use Dutch Fontina because it is quite mild in taste, thick and creamy in texture. I would like to try cooking this dish with other cheeses one day. I reckon the sauce made from Italian Fontina or Gruyere cheeses will create a different taste and texture. "Hey, I can do that too!"... but can I? Although everything seems so easy and quick on TV, in actual fact, my first-time pasta wasn't made as quickly as I thought I would. My husband reckon I will be eliminated immediately if I'm making fresh pasta in this Masterchef challenge. On the consolation side, maybe a little more practice makes perfect... In regardless, we all unanimously agree that it is definitely worth the wait to eat this freshly made pasta. The texture is so much nicer than the dried ones and a little QQ* tension with every single bite. Yum! * The meaning of "QQ" in Chinese term means chewy food with bouncy texture. All the beautiful ingredients that I used to make this dish. You can buy ready-made dried or fresh tagliatelle, but this is a really quick way to make your own. Crack the eggs into a food processor and add the flour. Whiz it up and listen for the sound changing to a rumble - this means the dough is coming together nicely. Turn the power off and test the consistency by pinching the dough. If it's a bit sticky add a little more flour and pulse again (Instead of using a food processor, I did the initial mixing by hand). Tip the dough mixture onto a floured surface and shape it into a ball using your hands. Give it a little knead until smooth, then divide your dough into 4 equal parts. Start on the thickest setting of your pasta machine and run the first bit of dough through 4 or 5 times, moving the rollers closer together each time until the pasta is silky, smooth and about as thick as a CD. Flour your finished sheet generously, then fold it up and cut across into 1/2-inch strips. Gather all the slices together and toss them through your fingers, with a little flour, to open them up and make your pile of tagliatelle. Place to 1 side and repeat with the rest of the dough. Bring a large pan of salted water to the boil. In a bowl large enough to rest on top of the pan, put your crème fraiche, fontina or other melting cheese and your Parmesan with a pinch of salt and pepper. Place the bowl over the pan for the cheeses to slowly melt. It won't take long. Meanwhile, trim any dry ends off the broccoli, then finely slice the stalks diagonally and leave the florets whole (cutting any larger ones in half). Note: I made this dish using 3/4 amount of the pasta recipe and half amount of the cheese sauce and the amount that I made can filled up 2 and 1/2 very hungry tummies. Oh Zoe, I am actually drooling at this dish! Fontina cheese is just perfect with pasta and I take my hat of to you for making your own. I've been itching to try making homemade pasta myself ever since I received the pasta maker attachment set for my stand mixer at Christmas. And I'm ashamed to say I haven't yet tried it! Thanks for sharing this post and taking some of the fear out of my plans - I feel more confident after reading this! 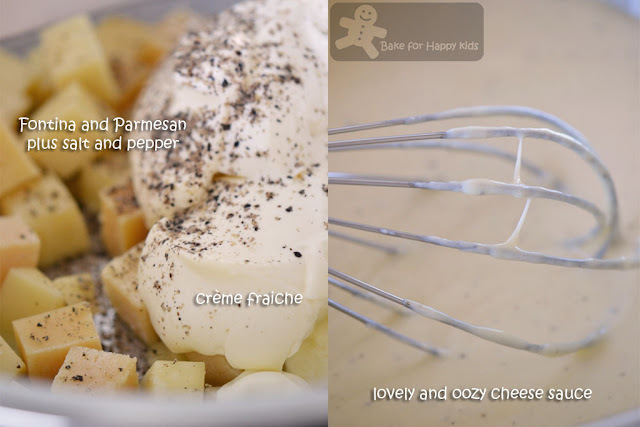 Thanks so much for sharing this with Made with Love Mondays (what a great example of true from-scratch cooking) and welcome to the series - it looks like you may have forgotten to add the Made with Love Mondays badge...? Sorry! I must have forgotten to add the badge and a link back to your post. Now, updated! Cheers! I've made this one. So yummy. Perfect weather for it too :) Nom! Oh I am SO impressed!!! wonderful - my taste buds are singing! I've learnt how to make gnocchi and tortellini before. It's easy but so time consuming (compared to buying :P), so kudos to you for making your own and doing such a good job at it! Homemade pasta, how lovely! You have reminded me that I need to take out my noodle maker and start making my own. I have used it only twice to make pasta! 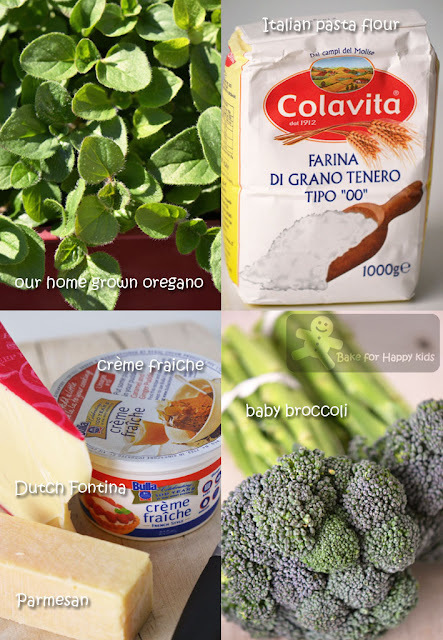 And it is so nice that you are able to get Italian pasta flour over there! 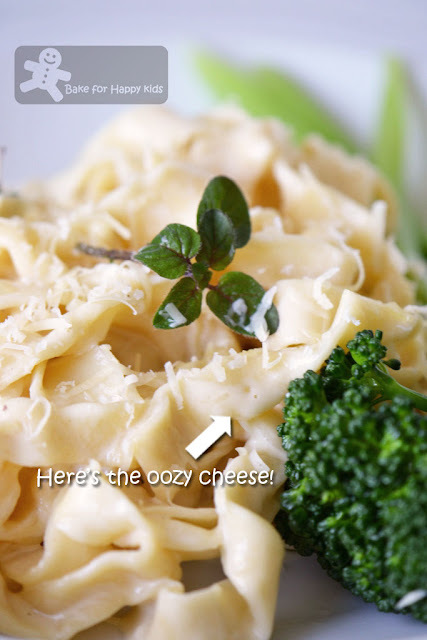 Oozy cheezy pasta is definitely a welcome meal in my house, looks delicious, Zoe! Zoe, this looks amazing, I am so impressed with your pasta. It is well done! This looks perfect Zoe!! I just want to grab a fork and take a bite...well why stop at only one bite....I want the full plate. Bravo to you for making the pasta from scratch. You made your own pasta from scratch. Not sure when I can find the courage to do that. You certainly too good. Hi Zoe! Your pasta came out amazing. It looks absolutely perfect! I so want to make pasta from scratch as well, as it tastes SO much better that the dried stuff. Its like anything homemade, its just tastes better. I laugh at how these cooking shows make everything look so easy. My daughter and I watched Giada make some calzones one night, and she made it look so easy that we decided to try and make a calzone the next day. Well, it was not easy at all. The sauce spilled out all over the baking sheet and the crust was thin in some parts and to thick in others. So, I applaud you for making the pasta from scratch. Wow, you really made the pasta from scratch, so lovely! I plan to try that some time, but only dared gnocchi (potato-dough pasta) or some finds of dumplings (filled pasta) before. yum! looks so delicious! i love pasta too! Zoe, congratulations on your 1st step! If I didn't read your story, I would have thought that this pasta was store-bought! I bought a very cheap pasta maker from k-mart in last Dec, all I did so far was took it out from the box & wiped clean it, then put back to the box again! I'm still waiting for 'the right day" to come & take my courage to make my own one, hahaha! I read from somewhere that the pasta needs to dry properly b4 cooking & they may only take seconds to cook comparing to the store-bought pasta, is that right? Thinking of the time in drying out, I have no clue at all how long is this going to take & it is one of the reasons I keep delaying to make my 1st move! Hi Zoe.....thank you for stopping by my blog. I am your newest follower as well...and this dish makes me drool a bit,lol:) I love creamy sauce on my pasta....especially fresh pasta. Yummm, this is something my kiddies will love. My little boy is so picky. oh these look absolutely divine. PERFECT actually. So yum! You even made the tagliatelle from scratch...awesome! Lovely dish, Zoe! My girls will definitely love this! 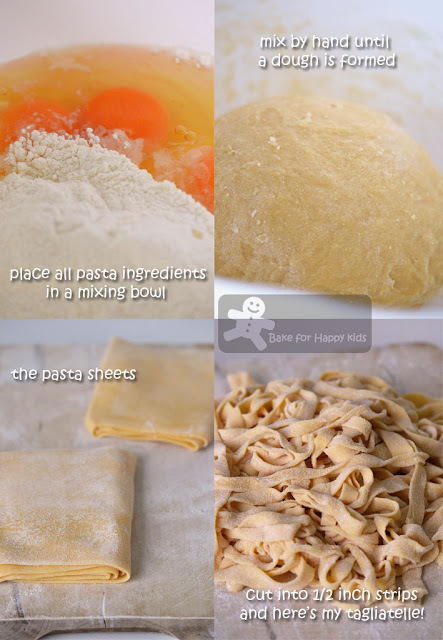 Making your own pasta sounds great! It's something I haven't tried! You just inspired me! The homemade pasta is very similar like the " mee hoon Ker" that I usually made. Homemade food always good and healthy ! oh my god does this sound delicious! yum! Oh, I love Jamie Oliver's pasta dishes and yours look simply amazing. I don't make my own pasta often, I don't have the patience, but I admire those who do it regularly. I like making fresh pasta but it can be a bit of a pain. However, unless you live close to someplace that actually makes their own fresh pasta (and that packaged stuff you buy at the grocery doesn't count), it's the only way to get the flavor and texture. I need to make it more often - that way it'd be a lot faster. Anyway, yours looks great, and I love the sauce. Good stuff - thanks. Nice Zoe...homemade pasta, that is awesome...love everything that you have in this pasta dish...very hearthy! Yum! The dish looks absolutely delicious! I've not tried making fresh pasta before... yours look perfect! Homemade pasta, so much better than the store bought ones, love the texture very much. like you said QQ:D Yours looks delicious with the oozing effect lol! Thank you for the sweet comment on my blog! I am happy you visted and Im following your fabulous blog now! !